There she is, Huggin' away! Well, I guess you find something new out everyday huh? 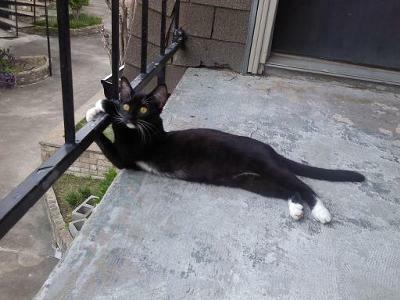 My family and I found out that she is very affectionate not just with humans, But with the railing outside of our apartment. She seems to like hugging everything in sight, as i've said before. She is also somewhat of a ninja; As childish as that may sound. She likes to jump from wall to wall with just her back feet, Truly amazing! Tuxedo cats are brilliant, I've fallen in love with turkey as if she were my own child. She has learned to yell at walls and sit on circular patterns on the floor. She likes greeting people at the door and giving you the good old butterfly kisses. I've taught her a trick too! When i treat her to wet food, before giving it to her, i tell her, "Go to your water bowl" and she will hop on top of her water bowl until i give her the food. Sometimes she will sit up right and innocently meow with a sparkle in her eyes. Oh she sounds like such a lovely cat. I shall feel fortunate if my newest addition, Rascal, turns out half as nice as Turkey. Our tabby died and so we now have Rascal. Take care of your Turkey. I love this picture! She looks so mischievous and innocent at the same time. And she's so smart. I love it when cats learn new tricks. Some people think that cats - unlike dogs - can't learn any tricks. But they couldn't be more mistaken. Thank you for the updates and lovely picture.